[/caption] Sunset along the town of Oceanside Beach offers an amazing view looking across its pristine beach and out towards the Pacific Ocean and Three Arch Rocks. Oceanside is a tiny little town just west of Tillamook and just north of Netarts. The town is small enough to fit in your back pocket but the views are some of the most stunning along the Pacific Northwest coastline. There are several hiking trails and dozens of beaches to discover. Three Arch rocks are almost perfectly positioned off the coast since the their distance from the beach offers some great photography opportunities. There are a few hotels and homes in Oceanside so you can find quite a few beachcombers walking along the beach but during sunset you pretty much have the beach to yourself when taking sunset photos. This photo was taken back on 7/2/09 and I took the shot with my Panasonic DMC-FZ30 point and shoot camera. I remember attaching my screw on ultra wide angle lens and held my orange tinted filter in front of the lens. I wasn’t using a CIR-PL or warming filter since the lens was a screw on and it would crack any filter that was on the camera. I set the ISO at 80 and the white balance at 0 in order to reduce the amount of light even though the sun had already set and it was 9:30pm. The camera was in shutter priority mode and the aperture was automatically set at F-4 and I manually set the shutter speed at 2 seconds. I wanted to get a very panoramic shot so I set the focal length at 10mm in order to get a large field of view. The tide was beginning to come in and some of the froth from the previous wave looked really cool so I took this shot. The indention along the sand was from the swells moving along the beach each time they rolled in. [/caption] There is no better place to be on a warm and late summer evening than along the Oregon Coast. 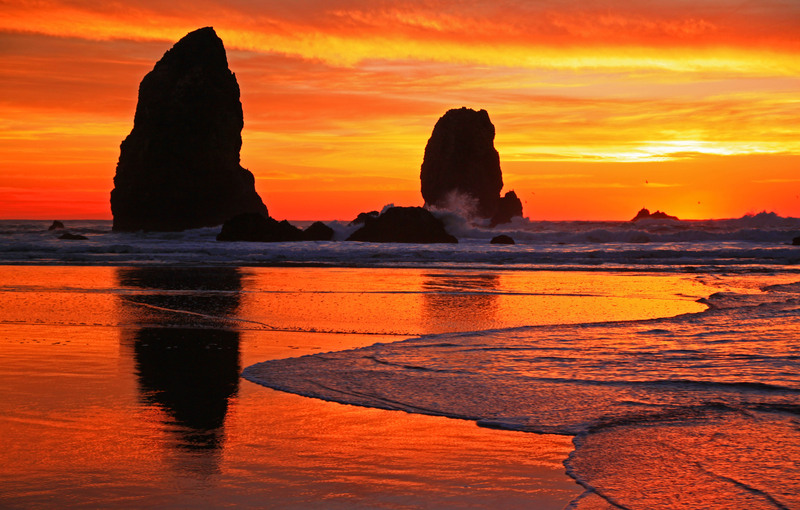 One of the best places to take advantage of the nice weather is at Cannon Beach, OR. 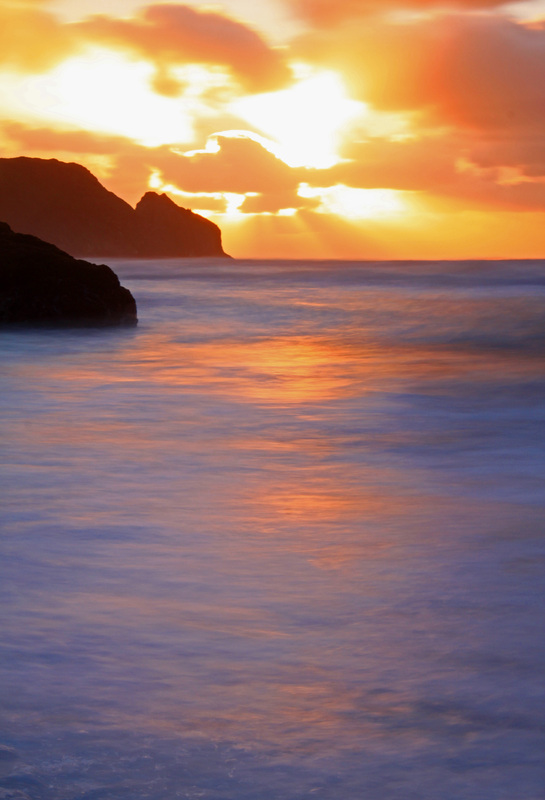 You can expect great sunset views and some of the best walking beaches in the state. Since many of the sunsets along the North Oregon Coast can be hit or miss, when the weather is showing a great sunset with no coastal fog, you want to head to the beach. This photo was taken on 9/30 and it was about 6:00pm so the sun was pretty intense and the glare was even more intense. Even with attaching my ND4 and my CIR-PL I wasn’t able to set the shutter priority due to the overexposure from the glare. I set the camera to Normal/Program mode and put the ISO at 200 and the white balance at -1.7. The shutter speed was at 1/125 second and the aperture was at F-7.1. The tide was pretty high so I wasn’t able to get as close to the rocks as I wanted to and I ended up setting the focal length at 23mm in order to get the rocks in the background while the sun was peaking around Haystack Rock. I lowered my tripod in order to get a good shot of the water coming in towards the camera. However, the halo from the sun made many of my photographs grainy around the rocks and sky. There were so many birds flying around the rocks that I wasn’t able to avoid a few of them from getting in the photo. [/caption] A crazy cloud formation appeared just before sunset in the San Juan Islands, WA. The sun was completely shrouded behind several cloud banks as more and more clouds swept across the scene. The sun was scheduled to set around 8:45pm and I took this photo at 8:20pm. The clouds just above Vancouver Island are a deep orange since the sun was lighting up the only part of the sky that it could. The clouds in the upper part of the sky were moving at a very high speed and almost looks as though I had set the camera mode to shutter priority. However, the camera mode was in Program/Normal and the shutter speed was only at 1/320 second. The aperture was automatically set at 9.1 since I had the ISO set at 100, the white balance at -0.7 and attached my CIR-PL and warming filter. I set the focal length to 55mm in order frame the clouds in the photo without showing too much blue sky. I was using my Sigma 17-70mm lens but with the lens at 17mm there was too much blue sky in the upper atmosphere and the orange hue was most dramatic where the sun was.